Fun Collaboration Between Two Geniuses! 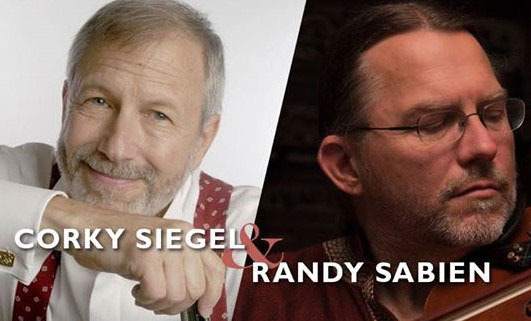 Randy Sabien draws from the classical technique and folk energy of jazz violinists and the result is swinging, rocking, bluesy, rhythmic jazz! He grew up playing violin while immersed in the music of the 60s and 70s and the result is nothing short of miraculous! This will be the 6th time Randy has performed here, always with different musicians. This time he brings the great composer, pianist, singer/songwriter and one of the world’s greatest blues harmonica masters, Corky Siegel. Among just a few of his accomplishments are his partnership in the renowned Siegel-Schwall Band, his collaborations with conductor Seiji Ozawa, performing as guest soloist with the New York Philharmonic, Boston Symphony, Japan, Portugal, Montreal Symphonies…and numerous performances with the great Doc Severinsen! To purchase, Click ADD TO CART below. Quantities can be updated before checkout. 2019 © Copyright Three Lakes Center for the Arts. All rights Reserved.